Bake #19 at The Home Bakers (THB), Lemon-Glazed Buttermilk Bundt Cake, is chosen by Grace of Life Can Be Simple. Grace, you've picked a fine one! This cake is simply delightful, I ate three mini bundlets after taking these photos, while they are still warm and lemony delicious! The original recipe is baked in a big bundt pan, but I have scaled down the recipe to half and chose to make mini bundlets instead. Which got me exactly 12 mini bundlets. The only changes I made was to omit the nuts and use dried cranberries instead, and it was a super good choice! For the buttermilk, I have replaced with my usual mixture of homemade yoghurt and milk. I have also reduced the sugar slightly to 1/3 cup for half a recipe. Do not skip on the lemon glaze! It is lemony, not too sweet and so perfect when drizzled over the mini bundlets. Make such a pretty little cake! The texture of the cake is very light, moist and tender, and I'm glad that I've substitute the nuts with dried cranberries, it was good! I'm pretty pleased with this lemony cake, another keeper recipe! For the full recipe, please visit Grace from Life Can Be Simple and to view other members' bake, drop by The Home Bakers (THB). 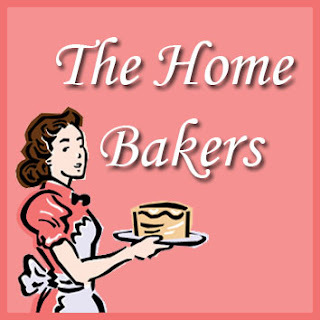 We are a group of home bakers who are currently baking from "Coffee Cakes" by Lou Seibert Pappas, until each recipe from this book has been baked. This is our bake no. 19 and we have 41 recipes more to go. If you are interested to be a member and join in our bakes, you may drop me an email at kitchenflavours@yahoo.com. 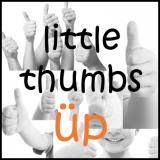 Today is the last day of submission for Mushroom Theme at Little Thumbs Up, hosted by me. I would like to thank each and every one of you lovely ladies and guy (Alvin, the thorn among the lovely roses! wink!) who has baked or cooked with me this month. Each and every dish submitted looks really scrumptious! May is a month of "Mushroom Overload"! From your kitchen, to your dining table, and in the most delicious way. I really appreciate you're taking your time and effort to join me in this month's theme. There's already 96 submissions so far! Thank you friends! And thank you too, to everyone who has visited and "feasted" on the visual links, and for taking your time to visit and leave your valuable comments. Well, the link will stay open until 12.00 midnight today, so you still have some time to share your Mushrooms yummies. The next theme "Curry Powder or Paste" will start on 4th June. So get some curry aroma going in your kitchen, and link that up with the next host, Everybody Eats Well In Flanders. Abalone Mushrooms, also known as King Mushrooms, have a concentrated protein and carbohydrate content as well as a large proportion of dietary fiber. These mushrooms have medicinal qualities including antioxidant properties, anti-inflammatory agents and tumor inhibiting qualities. Their subtle flavour is best when not overcooked, however it shouldn't be considered edible when raw. I'm sharing today, my last submission for this month's Little Thumbs Up, "Stir-Fried Crispy Mushrooms with Oats"
The photo may not look very nice, fried brown food are not the best "model"! They look rather bland and boring! Yup, yup, blame it on the food, not the person with the camera! LOL! Seriously, it may not look very nice, but it is delicious! The Abalone mushrooms are first cut into three or four pieces, depending on the size of the mushrooms. They are dipped in a batter, which is made up of all-purpose flour, baking powder, salt, pepper and water, and fry on both sides until golden brown and crispy. At this stage, a few crispy mushrooms will disappear! Haha! Delicious eaten minutes after frying, so crispy and yummy! To stir-fry the crispy mushrooms, melt some butter, fry some fresh curry leaves until fragrant, recipe calls for bird's eye chillies, but I have omitted that as my kids are eating this. Add the oats and the rest of the seasoning, stir-fry till well blended, add in the crispy mushrooms, stir-fry until the oats are crispy. Serve immediately. By dinner time, some half an hour later, I noticed some pieces have gone missing! It's my hubby and daughter, guilty as charged! Haha! During dinner, hubby even asked me how I cooked this dish, yes, he loves this mushroom dish a lot! This is quite addictive, you would find yourself reaching out for the next piece! And I enjoy eating the oats too, they are crunchy and fragrant! Give it a try, a definite thumbs up! I've used about 200gm of Abalone Mushrooms for this dish, and makes quite a lot. I have made some changes to the recipe and here I have given my version, to follow the original recipe, please click on the link below. Clean mushrooms and slice to three or four pieces, depending on the size of the mushrooms. Keep aside. Combine batter ingredients well in a mixing bowl. If there are lumps, use a hand whisk to whisk until batter is free from lumps. Heat oil, enough for frying. Dip mushroom pieces in batter and fry in the hot oil until golden brown on both sides. Dish out and drain on absorbent kitchen paper. Heat butter in clean wok until melted. Stir-fry curry leaves until fragrant. Add oats and seasoning. Stir-fry briskly, then add the crispy mushrooms. Toss and fry over high heat until oats are crispy. 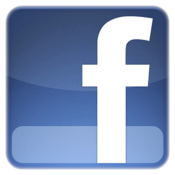 To submit your post to Bake-Along #45, Seeded Crackers, click here. Hi friends, only two more days for the submission of Mushrooms at Little Thumbs Up. Made this for dinner, eaten with plain white rice. This is a simple dish and quick dish to prepare, I have used chicken breast meat, though I think with boned-in pieces of chicken would be even better. I love eating taro, any way it is cooked, and with the addition of mushroom even better. In a bowl, soak the mushrooms in warm water to cover until softened, about 15 minutes; drain. Discard the stems and cut the caps in half. In a bowl, combine the chicken and cornstarch and turn to coat the chicken evenly. Let stand 10 minutes. Place a 3-quart saucepan over high heat until hot. Add the oil, swirling to coat the bottom. Add the garlic and ginger and cook, stirring until fragrant, about 15 seconds. Add the chicken and sausages and stir-fry until the chicken is lightly browned, 2 to 3 minutes. Add the mushrooms, taro, green onions, and sauce, reduce the heat to medium-low, cover and simmer, stirring occasionally, until the taro is tender, about 15 minutes. ( I have added in the white part of green onions along with other ingredients, and reserving the green parts until taro is tender, and added that last, just before serving). It's crunch time at Bake-Along this week. My baking buddy, Lena from Frozen Wings has chosen Seeded Crackers for this week's Bake-Along#45. It has been a long while since I've bake any "crunch" in my kitchen. There's an option to mix the dough either by hand or the food processor. Of course, I have chosen the easy and faster way, the food processor. The dough comes together in the food processor in less than 2 minutes! There's a few variation to the seeds and herbs that you can use, by changing the flavours, you can make these Seeded Crackers to your own liking. Here I have used only black sesame seeds and Herbes de Provence. While mixing the dough, I find that I needed to add another tablespoon of butter, as the mixture is still very floury without any visible pea-sized crumbs. This recipe uses 1 tablespoon of solid vegetable shortening, which contributes to a crispier cracker. I noticed that the amount of flour for 2 cups is stated as 315gm in the recipe, I chose to use the measurement in cups instead of the weight measurement, because as far as I know, 2 cups equals to 250gm of all-purpose flour, and not 315gm. Once the dough comes together, it is left to rest for at least 20 minutes at room temperature. Roll out the dough to a sheet as thin as possible, it may be baked as a big cracker that fits the baking sheet, or cut to shapes. I have chosen to cut the rolled dough to squares as I love to have crispy edges all around. The recipe uses 2 teaspoons of salt which is way too high in my opinion, I have reduced it to 1-1/3 teaspoon and still find the crackers a little salty. Baked for about 15 minutes until they are crisp and brown. Cool on wire rack until crisp. These crackers are really crispy and very tasty. The texture is light and crispy, buttery and a little too salty. The next time when I make this, I would reduce the salt further to maybe a scant teaspoon. Other than these, I have no complaints. I really like these crispy crackers and are very nice eaten with a cup of warm tea as an afternoon nibble. I would definitely make this again, with other seeds and different herbs, and with addition of cheese too! For our next Bake-Along, we will be baking based on a theme, "Theme : Cotton Soft Cheesecake". You may bake any recipe of Cotton Soft Cheesecake and link your post to the linky provided which will start on 24th June right up to 3rd July. Everyone is welcome! Combine the flour, sugar, salt, pepper, and poppy, sesame and mustard seeds and pulse 1 or 2 times to mix. Add the shortening and butter and pulse 7-10 times until the mixture forms large, coarse crumbs the size of peas. Pour in the cream and pulse a few times until the dough comes together in a rough mass. Using a plastic scraper, scrape the dough out onto a clean work surface and gently squeeze it together. Add a few more drops of cream if the dough will not hold a soft shape. Gently press the dough into a disk, wrap it in plastic wrap, and let rest at room temperature for at least 20 minutes or for up to 1 hour. Position a rack in the middle of the oven, and preheat to 350F (180C). Line 2 half-sheet pans or rimless baking sheets with parchment (baking) paper. Unwrap the dough disk and place on a lightly floured work surface. Cut the dough in half with a sharp knife or a bench scraper. Roll out one-half of the dough into a rectangular sheet as thin as possible without tearing, dusting it with flour as needed to prevent sticking to either the work surface or the rolling pin. Trim the edges of the dough to fit the prepared pan, then carefully transfer the sheet to the pan. Repeat with the second half of the dough. Alternatively, using a pizza wheel or a sharp knife, cut the dough sheets into shapes and place on the pans. Bake 1 sheet of crackers at a time until they are crisp and brown, 12-15 minutes. Transfer to wire racks and let cool completely until crisp. If you have baked the dough in sheets, break each sheet into shards. The crackers are best when eaten fresh, but they may be stored in an airtight container for up to 5 days. reduced the salt to 1-1/3 teaspoon and still find it salty. Will reduce to scant 1 teaspoon the next time. will reduce the black pepper slightly as it is a little too peppery. added in an additional 1 tbsp cold butter, as it was still very floury and no crumbs visible. for this batch, I have omitted the poppy seeds and mustard seeds, and used 2 teaspoons black sesame seeds and 1 teaspoon Herbes de Provence. For today, I'm sharing a stir-fry dish, Spicy Long Beans with Sausage and Mushrooms. This stir-fry dish is all about texture and flavour, the salty, sweet, and peppery accents, according to the author. All ingredients are cut to about the same size. There's long beans, dried shiitake mushrooms, Chinese sausage, pickled Sichuan vegetable, minced meat and fresh coriander leaves. This recipes uses pickled Sichuan, usually sold as a large piece, the ones that is covered with chilli paste, which requires washing under running water to remove the chili paste before cooking, as they are very salty. Here, I have used the packet of ready-to-eat pickled Sichuan, which makes life easier, just use the veggies as it is, you just have to chop them smaller to about the same size as the other ingredients. I love eating it as it is, as they are not overly salty, a few pieces would not make it to the cooking pot! Just as the author says, this dish is all about texture and flavour. For me, the textures are, the crunchiness from the long beans, the crisp from the pickled Sichuan, the chewiness from the mushrooms and the minced meat. As for flavour, saltiness from the pickled Sichuan, sweetness from the sausage and fragrance from the fresh coriander. Of course the correct amount of seasoning brings all the flavours comes together. This is a lovely dish, eaten with steamed white rice and would be great too, with plain congee. In a medium shallow bowl soak the mushrooms in 3/4 cup cold water for 30 minutes or until softened. Drain and squeeze dry, reserving 2 tablespoons of the soaking liquid. Cut off the stems and mince the mushrooms. Trim 1/4 inch from the ends of the long beans. Cut the long beans into 1/4-inch-long pieces to make about 3 cups. Rinse the preserved vegetable in cold water until the red chili paste coating is removed and pat dry. (I use ready-to-eat preserved Sichuan vegetable in a packet, so I used it directly, chopping it to pieces). Finely chop to make about 1/4 cup. In a small bowl, combine the soy sauce, rice wine, and sesame oil. Heat a 14-inch flat-bottomed wok or 12-inch skillet over high heat until a bead of water vaporizes within 1 to 2 seconds of contact. Swirl in 1 tablespoon of the peanut oil, add the pork and sausage. Using a metal spatula, break up the pork, and sitr-fry 1 minute or until the pork is no longer pink. Add the mushrooms and stir-fry for 1 minute. Swirl in the remaining 1 tablespoon peanut oil, add the beans, and stir-fry 1 minute. Swirl in the 2 tablespoons reserved mushroom liquid. Cover and cook 30 seconds. Uncover and add the preserved vegetable, scallions, and cilantro. Swirl the soy sauce mixture into the wok. Sprinkle on the salt, sugar, and pepper and stir-fry 1 to 2 minutes or until the pork and sausage are cooked and the vegetables are crisp-tender. I am beginning to like White Button Mushroom a lot. They are great in any form of cooking or baking. For today I have use these mushrooms as a filling for a baguette. I have been thinking of making some breads, and since mushroom is the theme for this month at Little Thumbs Up, a filling made of mushroom seems the perfect choice. The original recipe from the book uses an entirely different mushroom filling, and I have decided to make my own filling, while the recipe for the baguette is taken from that book. The dough is mixed and kneaded in the bread machine. At the end of the cycle, it is taken out, rolled and filled with the mushroom filling. This is a flavourful herby dough, it has dried chilli seeds (I use coarse chilli flakes) and dried mixed herbes de Provence. Originally this is made into a long baguette, about 17" long, I have divided the dough into two, making two smaller baguettes. For the filling, while the original recipe uses dried mushrooms which was soaked with water and cooked with onions, garlic and red wine, I have chosen to make my own filling. Some chopped garlic are sauteed till fragrant, and chopped fresh White Button mushrooms are added in, these are cooked until the juices from the mushrooms have almost dried out. Season with some garlic powder and keep aside to cool. And I have used some combination of Cheddar and Mozzarella cheese to be scattered on the rolled dough before adding the mushroom filling over. Just before baking, the top of the baguette is brushed over with some olive oil and I have sprinkle some garlic powder over the top, which I am so glad that I did, because the bread smells incredibly nice and taste garlicky delicious! This is a lovely and very tasty stuffed baguette. The mushroom filling is so good, and with the melting cheese inside when eaten while still warm, is very, very, nice! For the bread itself, it has a soft texture with a slight spicy herby taste, though my son says that it is not spicy at all! And crispy crust! I love eating the two ends of the baguette while they are warm and the crust delightfully crispy! Yes, the two ends are all mine, because the family wants the centre where there's melting cheese and delicious mushroom filling! Need some mushroom overload? Haha! Have the baguette with some mushroom soup! We had the baguette with Campbell's mushroom soup, for our simple lunch. Yums! The hubby finished almost a whole baguette! Lift the tin out of the bread machine, fit the kneader blade then add the measured cold water and olive oil. Spoon in the flour then add the sugar, salt, chilli seeds and herbs. Make a slight dip in the centre of the flour then sprinkle in the yeast. Insert the tin into the bread machine. Shut the lid and set to dough or basic dough. Press Start. When dough is ready, remove dough and proceed to step 3. Make the filling : Heat 1 tablespoon olive oil in a small saucepan. Add chopped garlic, saute till light golden and fragrant. Add in the chopped mushroom and stir for a couple of minutes until the juices from the mushroom almost evaporates. Stir in garlic powder. Transfer filling to bowl and leave to cool. Tip the dough out to a lightly floured surface and knead well. Divide the dough into two equal round sizes. Roll out one piece of round dough into a rectangular shape, about 6"x10". Scatter half of both the cheeses onto the dough, leaving about an inch border all around. Top with half of the mushroom. Roll up the dough starting with one of the longest edges, pressing the seams to seal. Repeat with the other ball of dough. Put the dough on a greased baking sheet, brush with some olive oil and sprinkle with some garlic powder. Cover loosely with oiled clingfilm and leave in a warm place for 30 minutes until well risen. Bake in a preheated oven at 200C (400F), gar mark 6, for 25-30 minutes until golden brown. Cover with foil if overbrowning. Transfer to a wire rack to cool. Buna Shimeji Mushrooms used to be very expensive some years back, but now these are more affordable, buying from the morning market is cheaper than if we buy them from the supermarkets. I used to buy from the supermarkets until I've discovered that the morning market are selling these mushrooms at a cheaper price. I bought the White Buna Shimeji at RM3.00 per pack, while the Brown Buna Shimeji is RM2.50, why the price difference? According to the seller, the white ones tastes better and crunchier than the brown. Really? There are over 20 species of Shimeji Mushrooms, Buna Shimeji one of them. They are sometimes known as Beech Mushrooms. These mushrooms have a delicately mild flavour and are great in stir-fries, and are usually added last, in a soup or stews, to maintain their crisp texture. I find these mushrooms very cute, lovely to look at! My original plan was to use these Shimeji mushrooms for other dish, but somehow they ended up in this braised mushroom dish! I usually cook this dish using oyster mushrooms with a mixture of some sugar snap peas and carrots. But since the Shimeji mushrooms have been in my fridge for a couple of days already, I decided to use them for this simple dish, along with a packet of fresh shiitake mushroom. This is really a simple dish, but nice, eaten with rice, along with some other dishes. 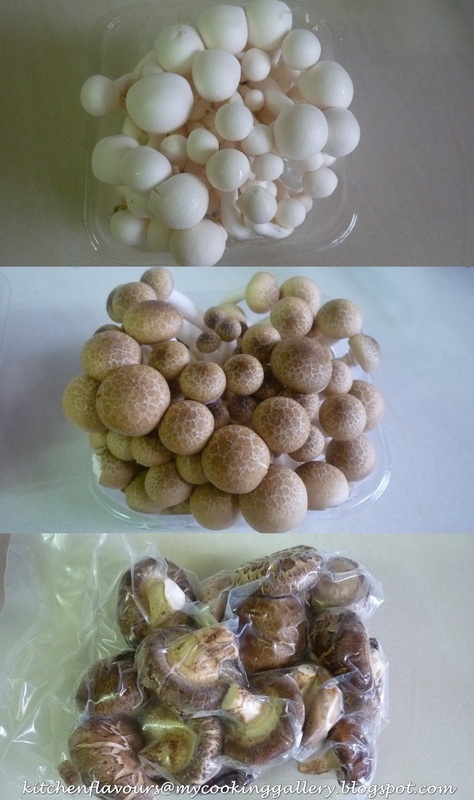 Clean the mushroom : For both the Shimeji Mushrooms, cut off the base of the cluster, leaving each mushroom as individual. Rinse and drain. For Shiitake, discard stems. Wash caps under running water, gently remove any dirt. Drain. Heat oil in saucepan or wok. Saute the chopped garlic and ginger till fragrant and starting to brown. Add in the chopped fresh chilli, white part of the chopped spring onions. Stir for a few seconds, add in the Shiitake mushrooms, stir, add in water, chicken stock powder, oyster sauce, pinch of salt, white pepper powder, to taste. Cover and let simmer for 5 minutes until mushrooms are tender. Add in Shimeji mushrooms, stir for 2-3 minutes. Stir in the chopped green spring onions. If dish is a little watery, thicken with some cornflour solution, optional. Serve to a serving dish and serve hot. Mushroom recipe for today : Mushroom Omelet with Cheddar and Thyme. Made this delicious omelet for our afternoon lunch, and it was yummy! Fresh mushrooms contains lots of water, so these are sliced and sauteed till the juices oozes out and evaporates. The recipe uses white or cremini mushrooms, but any fresh mushrooms would work well in this omelet, here I have used fresh Shiitake mushrooms. When the mushrooms are lightly browned, season with some salt and pepper along with some fresh thymes, keep aside while you prepare the eggs. Eggs are beaten lightly with a little cream, salt and pepper. Heat up some oil, pour egg mixture in heated pan, cook over low heat until just begin to set. When eggs are almost completely set, sprinkle some grated cheese over one half of the egg, and scatter some of the cooked mushroom over the cheese. Fold the unfilled half over the mushroom and cheese, cook for a further 30 seconds and slide onto a serving plate. Sprinkle more chopped thymes over and serve immediately. Yum! This is perfect for a lazy weekend brunch. In a frying pan, preferably nonstick, melt 1 tablespoon of the butter over medium heat. Add the mushrooms and cook, stirring occasionally, until the juices evaporate and the mushrooms begin to brown, about 6 minutes. Stir in 1/2 teaspoon of the thyme and season with salt and pepper. Transfer to a bowl and set aside. Preheat the oven to 200F (95C). In a bowl, whisk together the eggs, cream, 1/4 teaspoon salt, and a few grinds of pepper just until blended. Do not overbeat. Add half of the remaining 1 tablespoon butter to the frying pan and melt over medium heat until hot. Tilt the pan to cover the bottom evenly with butter. Add half of the eggs mixture to the pan and cook until the eggs have barely begun to set around the edges, about 30 seconds. Using a heatproof spatula, lift the cooked edges and gently push them toward the center, tilting the pan to allow the liquid egg on top to flow underneath, then cook for 30 seconds. Repeat this process two more times. When the eggs are almost completely set but still slightly moist on top, sprinkle half of the cheese over half of the omelet. Scatter half of the mushrooms over the cheese. Using the spatula, fold the untopped half of the omelet over the filled half to create a half-moon shape. Let the omelet cook for 30 seconds more, then slide it onto a heatproof serving plate. Keep warm in the oven. Repeat to make a second omelet in the same manner. Sprinkle both omelets with the remaining 1/4 teaspoon thyme, dividing it evenly. Serve at once. 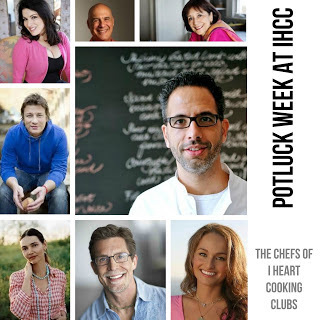 I'm linking today's post to two events, one is Little Thumbs Up, where the selected ingredient for this month is Mushrooms, and I Heart Cooking Clubs (IHCC), for our Potluck week where we can select to cook from any of our previous featured chefs' recipes. So, I have chosen to cook Madhur Jaffrey's Mushroom Curry, something that I've wanted to try, and seems the perfect selection for both Little Thumbs Up and IHCC. Brown Button Mushroom, also known as Cremini Mushrooms. They have a similar appearance to the White Button but have a light-tan to rich-brown cap and a firmer texture. Personally, I find that they taste almost the same! For this mushroom dish, I'm using Brown Button Mushrooms. Bought two packs last week, used some of it for the Mushroom Chocolate Cookies, my previous post, and use up the balance for this curry dish. This is another lovely dish from Madhur Jaffrey. Suitable for vegetarians and can be eaten with either rice or bread. Surprisingly, the only spices used are ground coriander and chilli powder. This dish uses a small amount of yoghurt and tomato puree. The mushrooms are cut to big chunks, so that they do not get lost in the sauce during cooking, they are first stir-fried in a little oil to get rid of the raw look and later are added in to braise together with the sauteed spices. We ate this with some roti paratha, I use Kawan brand frozen paratha, one of my favourites. Since I'm serving this to my kids as well, I have used the amount of chili powder as per the recipe, about 1/4 tsp, which makes out quite a mild curry. For spicier taste, you might want to increase on the amount of chili powder. This is really a simple curry, so do not expect one that is bursting with very bold curry flavours, but it is kinda nice, especially when eaten with paratha. 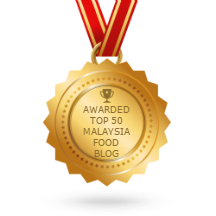 And, I'm also linking this post to Little Thumbs Up event, hosted by Joyce, kitchen flavours, organized by Zoe from Bake For Happy Kids and Doreen for my little favourite D.I.Y. Put the ginger, onion and garlic into the container of an electric blender along with 3 tablespoons water and blend until smooth. Wipe the mushrooms with a damp cloth and cut them into halves or quarters, depending upon size. Put 3 tablespoons of the oil in a non-stick frying pan and set over high heat. When hot, put in the mushrooms. Stir and fry for 2-3 minutes or until the mushrooms have lost their raw look. Empty the contents of the pan into a bowl. Wipe the pan. Put the remaining oil into the pan and set over high-heat. When hot, add the paste from the blender. Stir and fry for 3-4 minutes until it starts turning brown. Add 1 tablespoon of the yoghurt and fry for 30 seconds. Add another tablespoon of the yoghurt and fry for 30 seconds. Do this a third time. Now add the tomato puree and fry for 30 seconds. Add the ground coriander and stir once or twice. Now put in 300ml water, the mushrooms and their juices, salt and chilli powder. Stir and bring to a simmer. Turn the heat to low and simmer for 5 minutes. Sprinkle the green coriander over the top before serving. White button mushrooms are very popular in the United States, it represent about 90% of mushrooms consumed in the U.S. These mushrooms have a very mild taste and the flavours intensifies when cooked. They can be sauteed and cooked in any way, and even eaten raw in salads. A serving of 4 to 5 white button provides 18 calories, 0 gram of fats and 3 gram of carbohydrates. It is a good source of antioxidant selenium, the B vitamin riboflavin, niacin and pantothenic acid, copper, 300gm of potassium per serving. While those info above are very informative, and I would probably could not remember all that in the next minute, what I do know is these mushrooms are so delicious, sauteed and use as a quiche filling! Yum! Mushroom and Shallots Quiche, so good! Quiche is one of my most favourite savoury pastry. Especially if it has bacon or ham in it! Both bacon or ham, makes everything tastes so much yummier! This recipe does not call for either ham or bacon, but I have added in some ham chips, just because! And I have used more shallots than the recipes calls for. The pastry is a little difficult to work with, it is very soft, refrigerate it until firm and work quickly, very quickly! But then it is worth the effort! I made a full batch of the pastry and kept half of it in the freezer, for another one of my quiche days! This is so good! The mushrooms, ham, cheese and shallots are so delicious together! On a lightly floured surface, roll out dough to a 14-inch round, about 1/8 inch thick. Fit it into a 10-inch round fluted tart panb with a removable bottom, gently pressing dough to fit. With a small knife or rolling pin, trim excess dough flush with rim. Pierce bottom of shell all over with a fork. Refrigerate or freeze until firm, about 30 minutes. Preheat oven to 375F. Line shell with parchment, and fill with pie weights or dried beans. Bake until crust is beginning to brown at edges, about 30 minutes. Remove parchment and weights; bake until bottom of crust is dry but not yet golden brown, 5 to 10 minutes more. Transfer shell to a wire rack to cool slightly. Meanwhile, make the filling of your choice, then prepare the custard ; In a medium bowl, whisk together milk, cream, eggs, and yolk until combined, then whisk in nutmeg and season with salt and pepper. Place tart pan on a rimmed baking sheet. Sprinkle half the cheese evenly over bottom of crust. Sprinkle with filling, then top with remaining cheese. Carefully pour custard over cheese. Bake until just set in the center, 30 to 35 minutes. Transfer to a wire rack to cool at least 10 minutes before serving. Serve warm or at room temperature. Heat oil in a large skillet over high. Cook shallots, stirring constantly, until translucent, about 1 minute. Add mushrooms (and ham bits, if using) and season with salt and pepper. Cook, stirring frequently, until mushrooms are dark golden brown, 8 to 10 minutes. (Mushrooms will release liquid at first; cook until it has evaporated, adjusting heat as necessary). Transfer to a bowl, and let cool slightly. Pulse flour, salt, and sugar in a food processor (or whisk together by hand in a bowl). Add butter, and pulse (or quickly cut in with a pastry blender of your fingertips) until mixture resembles coarse meal, with some larger pieces remaining. Drizzle 1/4 cup water over mixture. Pulse (or mix with a fork) until mixture just begins to hold together. If dough is too dry, add 1/4 cup more water, 1 tablespoon at a time, and pulse (or mix with a fork). When mixing in the cold water, start with 3 tablespoons first, adding 1 tablespoons at a time until mixture just begins to hold together. In total, I only used about 1/4 cup plus 1 tablespoon of ice water.